Many performers can play and produce music. Some can even sing. However, rare are those who use their instrument to say things that are essential. Marielle Nordmann is one of them. Born in France, she starts the piano at age 6. At age 10, she meets the legendary harpist Lily Laskine, which determines the choice of her instrument and of her career. Internationally acclaimed soloist, she performs with leading musicians such as Yuri Bashmet, Claude Bowling, François-René Duchâble, Patrice Fontanarosa, Emmanuel Pahud, as well as wide array of artists such as actor Michel Duchaussoy, hip-hop and rap artist M.C. Solar and French TV host and movie director, Pierre Tchernia. 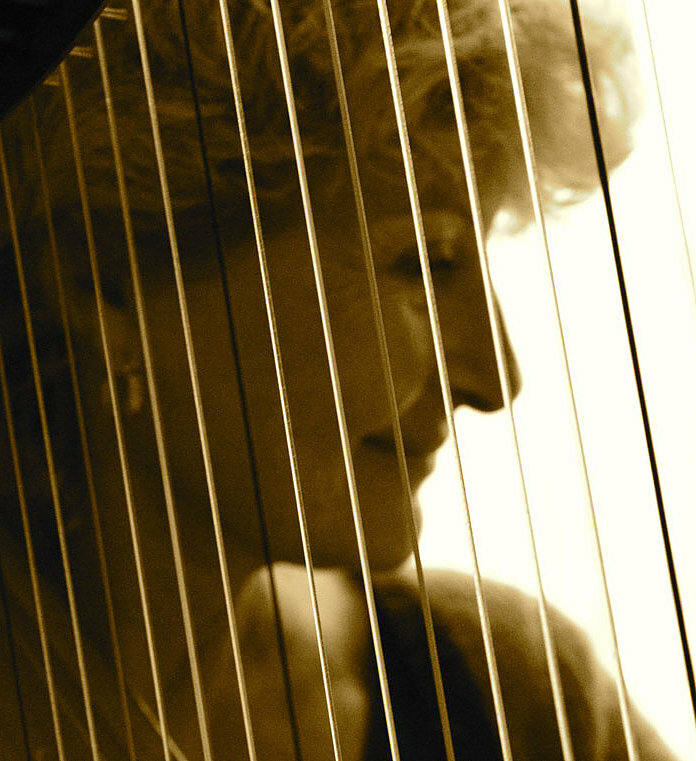 Her repertoire includes pieces specifically written for the harp, as well as transcriptions (often of her own making) and the creation of contemporary works by J. Charpentier, E. Denisov, G. Finzi, J.Françaix, P. Hersant, M. Landowski, L.Petitgirard, E.Rautavaara, A. Bénéteau… She was entrusted with the world-creation of the concerto in C minor of Elias Parish-Alvars, in Israel with the Israel Sinfonietta, conducted by Avi Ostrowsky. In 2010, she founded the duet “Encuentro” (harp and bandoneon) with Eduardo Garcia. Besides her stellar career as an international soloist, Marielle Nordmann has started, several years ago, to produce musical shows where she likes to mix different art forms (mime, dance, comedy) and where she also performs as narrator: “La Musique et l’Enfant” a musical tale with masks and tap dancing, and the creation, in 2011, of a musical performance involving professional and non-professional musicians: “ Le Conte de Jataka” (directed by M.P. Labrune). Co-founder of the “Journées internationales de la Harpe” (in Arles) and of the International Harp Competition Lily Laskine (in Paris), she also introduced Masters Classes for children at the Conservatoire Supérieur de Paris and taught in Argentina for 10 years, also creating the first National Harp Competition in that country. Marielle Nordmann is presently the Artistic Director of the Festival “Les Musicales” at the Organgerie of Bagatelle (Paris) for the GBP Foundation. Her rich personality, sense of humor, vitality and human warmth all concur in making her a “Grande Dame.” Her sound, which is both powerful and well-rounded, combined with an exceptional musicality, and an acute sense of the musical phrase, definitely place her among the Master soloists of our time.